Seattle, WA, May 1, 2017 – Uptime Institute today announced the findings of its seventh annual Data Center Industry Survey, which examines the key trends and developments shaping today’s IT infrastructure industry. The results reveal that while the majority of IT organizations are moving some of their workloads to the cloud, the percentage of workloads residing in enterprise-owned/operated data centers has remained stable at 65 percent since 2014. The takeaway is that with the explosive growth in business critical applications and data, enterprises continue to see the data center as not just important, but essential to their their digital-centric strategies. Data center budgets strong in 2017. Compared to 2016, nearly 75 percent of companies’ data center budgets have increased or stayed consistent this year. Enterprise-owned and colocation data centers still primary compute venue. On average, respondents report that nearly two-thirds of their IT assets are currently deployed in their own data centers, with 22 percent deployed in colocation or multi-tenant data center providers, and 13% deployed in the cloud. IT resilience is growing, complementing redundancy. The majority of companies (68 percent) rely on IT-based resiliency. Using an IT architecture with multiple, geographically distributed data centers, they rely on live application failover in the event of an outage. At the same time, 73 percent of respondents said they are not deploying lower redundancy physical data center sites despite increased adoption of IT-based resilience. Downtime matters. More than 90 percent of data center and IT professionals believe their corporate management is more concerned about outages now than they were just a year ago. Metrics and business. While 90 percent of organizations conduct root cause analysis of any IT outage, only 60 percent report that they measure the cost of downtime as a business metric. 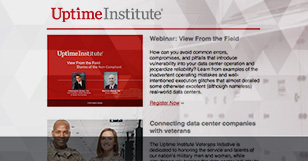 Uptime Institute will be holding a webinar on Tuesday, May 2 to deliver in-depth analysis and commentary on key findings from this year’s survey. Topics will include the impact cloud computing has on capacity planning, major challenges facing IT infrastructure organizations today, the adoption rates for new technologies, and more. For more information on the survey results, and to sign up for the webinar, click here. The seventh annual Uptime Institute Data Center Industry Survey was conducted via email in early 2017 and includes perspectives from more than 1,000 data center professionals and IT practitioners across the globe.